Lately I’m all about throwing on some bright colors in a gloomy day. 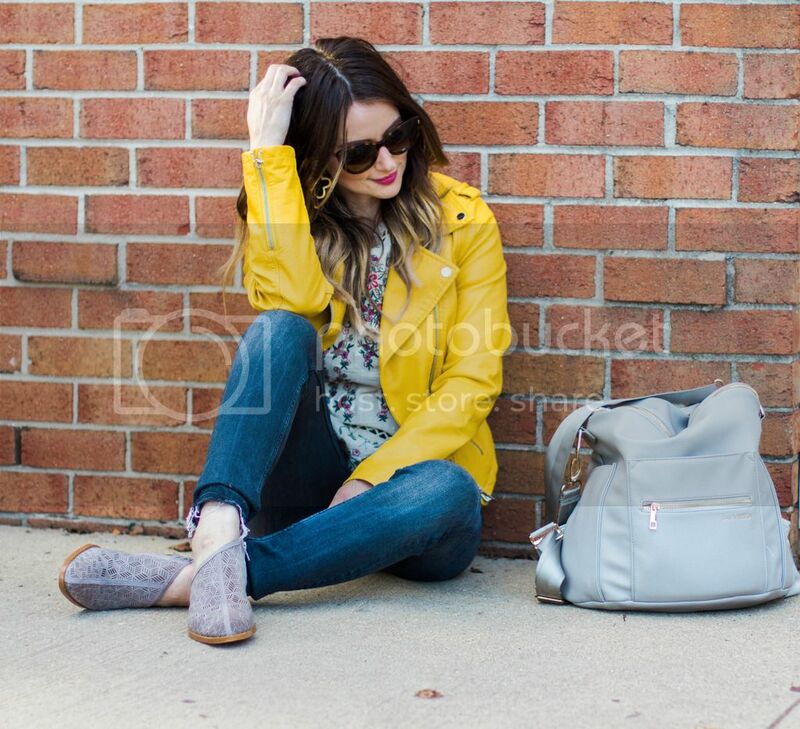 Im kinda obsessed with this darling yellow biker jacket (only $53!) If you couldn’t tell by now, yellow is my favorite color and is super on trend this year.It pairs beautifully with this embroidered peplum blouse from Chicwish. The neckline, embroidery, and crochet details are just to die for, and the price isn’t too shabby either. Now that the older boys are in school, I’m able to get a few hours of one on one time with the baby every day. Granted I have two kids in three different schools (long story), so that time is very broken up and a bit chaotic, but I do enjoy having that short time with just him. I usually pull out our new Silver Cross Wave c/o stroller, and go for a stroll. I love this stroller because it can be used as a double or single, and rides like a dream. As a blogger I get the opportunity to review a lot of strollers. In fact, I think I might like baby gear more than clothes, bags, or even shoes right now! I get giddy when a new item for the baby arrives. Anyway, we have used and tested out a lot of strollers lately, and my husband and I agree that this bad boy is the Rolls-Royce of them all. By far my favorite stroller, and I love the sleek design with leather detailing. When it comes to folding it up, its simple and folds compact. They really put a lot of thought into the detailing and design of this stroller; everything has its place and flows beautifully. Even the main seat adapter has three different positions, and can fold down when you’re ready to start packing up and want your stroller nice and compact in the trunk of your car. Silver Cross really outdid themselves with this beauty, and I will have a full review coming soon. I just had to share my love for this stroller with you all because it’s pretty phenomenal and I almost want to shout it from the rooftops! I have finally found the perfect stroller for my busy, crazy, loud, boys! Haha Can I get a mama fist bump? Thank you SilverCross for gifting me this amazing stroller, and thank you Chicwish for sponsoring todays post.